Accompanied by her cat, Fang, and her best friends, Lily and Charley, 10-year-old Mona -- who happens to be a vampire -- uses her imagination to morph into a creature of the night. But don't worry ... she won't bite. The gang sets out to retrieve a hat; a rival sends a robot to baby-sit for Belinda. A comic book villain stalks the town; a game takes control of children's lives. A villain steals the town's dogs; Mona creates a dinosaur. The Whirling Void confuses the town; garden gnomes vanish. 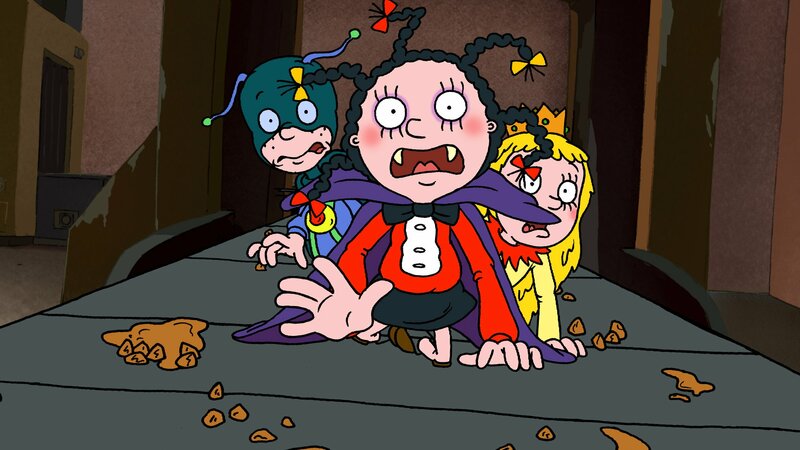 Mona becomes a costume competition finalist; a ray gun shrinks Mona and Charlie. An alien becomes a student; a shy neighbor helps save the town. An ancient curse plagues the town; aliens plot to dominate the world. A vampire hunter becomes a student; a siren puts a spell on Charley. Mona loses her secret scrapbook; a couple takes over kitchen duties. An Egyptian mummy terrorizes the town; a snowman experiment goes awry. Miss Gotto may be enthralled with a voodoo chief; ghoulie haunting a laundromat. Gotto bought a house, but there's something she doesn't knows... the house is haunted! Mona's class learns about the legendary Wendingo on a camping trip; Charley stays up all night. A gremlin sabotages a stunt man's motorcycle; a yam terrorizes the town. A man creates a miniature town; Mona is switched with an evil reflection. Rattling, groans and soggy floors; a werewolf is loose in the school. Mona tries to capture an evil genie; Angela designs creepy dolls. A chemical enlarges fleas to human size; Principal Shawbly loses his shadow. Mona tests her fortune-cookie fate; Mona develops empathy for Angela. A creature feeds on the energy of others; teachers are substituted by aliens. Cupid's cousin Stu ruins St. Valentine's Day; Mona finds miniature pirates. After a mysterious clockmaker does some work on the new town clock, strange things start to happen. The new kid in class doesn't bring a very big lunch to school... in fact he eats "like a bird." It's a rainy afternoon, and Mona's tearing through the attic so noisily that her mother worries she'll wake the dead. The latest pre-teen pop music sensation, the "Brainwaves", is all the rage with the kids at St. Faith's.